Birthdays are special, and so are your friends and family members. Show you care with a professionally designed birthday e-card that arrives electronically on the big day. Whether you choose traditional, religious, contemporary, funny, or outrageous, your e-card sends the message that you appreciate and honor the recipient. Ojolie e-cards provide a contemporary expression of the timeless tradition of personal card writing. The selection of birthday e-cards manages to combine pretty with surprise and delight just as the company's French name does. Let the birthday celebrations begin; Blue Mountain offers full-screen high-quality animated birthday cards that will make your family and friends smile. Beautifully drawn and meticulously animated, Jacquie Lawson's greeting cards make every birthday a happy, fun and memorable event. One of these charming, quaint designs is bound to be perfect for your friend. Combine an animated greeting card with your favorite musical style and lyrics (prominently featuring the recipient's name) that are sung and recorded just for this special occasion. Add a personal message and send one of the coolest e-card birthday experiences around. These are not your father's greeting cards. Check out the e-card selection at CardFool for cards with attitude and humor. This light-hearted selection features plenty of cats and political figures. You can even add yourself to a selfie with the current president. At Punchbowl, you can send birthday e-cards that mimic physical cards closely. It's not just the e-paper and e-envelopes that look good. The designs and typography are a pleasure to behold, send and, let us hope, receive. Birthdays should be fun. If they are not, it might be because the hilarious, splendid JibJab greeting is missing. Pick a card and personalize it with your image. Soon, you'll be singing and dancing your way to your friend's birthday celebration. Hallmark e-cards offer birthday wishes in every mood, from funny to beautiful to romantic. Let your friends know how special they are on their special days with these beautiful cards from the king of greeting cards. The stream of spectacular birthday cards coming out of Americangreetings.com is never-ending. Pick from heartfelt greetings and comic dancing cows to inspirations and religious messages. Chances are good you can find the right card to make your friend's day extra special. Meticulously drawn and beautifully designed, the timeless postcards at CardCow.com evoke a genteel past and make great birthday e-cards. The muted colors, classic illustrations, and photos date to a time long gone, yet comforting. Fashionably late for a birthday? Blame it on the internet! JustWink has the right card. Late by some six months? Send a JustWink half-birthday card. Just in time? JustWink has witty cards where the words, drawing, and typography match the mood. Fisher, gardener, golfer? Cat, dog, dove? Rugby, soccer, scuba? Katies Cards has wonderfully crafted and lovingly animated birthday greetings for all these themes and more. These cards range from traditional to quirky and are available for children ages 1 to 8 and everyone else from 8 to 80+. Birthdays come only once a year. Make the occasion special with a card from Kisseo, where the e-cards are sentimental, funny, and charming. Personalize whichever card you choose with your memories and emotions of special moments in the past or your shared history. KudoBoard lets you invite friends or coworkers to sign and contribute to a group birthday card before you send it. You and your friends add messages, photos, and videos on a "board" until you're pleased with the content. Then you push a button to deliver the online board to the recipient. 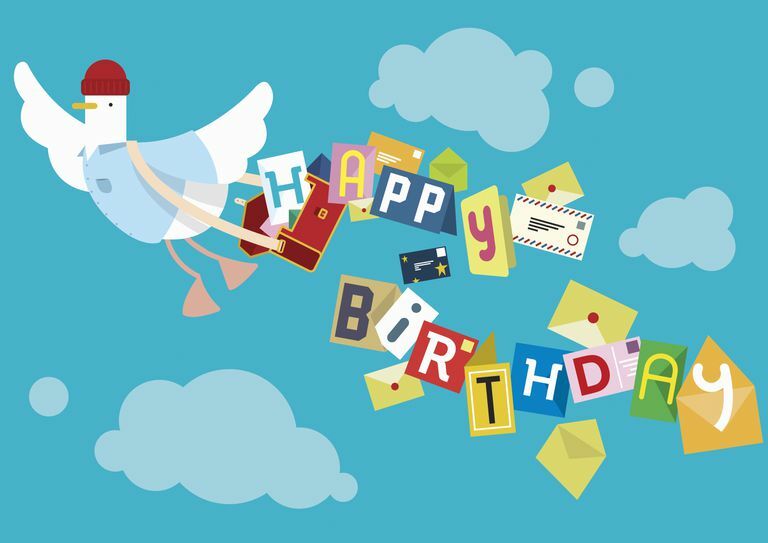 At Care2, you'll find birthday e-cards that are nicely animated, mostly funny and always congratulating. These cards are guaranteed to make your friend giggle or guffaw — just the right way to kick off a birthday. As a bonus, Care2 donates to a worthy cause for each free card you send. Inspire your favorite people with scripture and Christian birthday greetings from DaySpring. This small but impressive collection of birthday e-cards is perfect for sending birthday wishes to a parent or friend. If you're into laugh-out-loud funny animated cards, GreetingSpring birthday e-cards come with fun and inspiration. You won't find many "traditional" cards here, but you won't miss them, either. The cards that this site offers are beyond quirky and bound to be the most memorable birthday cards your friends receive. The birthday cards you send from the Victorian Trading Company spread Victorian style and genteel charm. The beautiful paintings and vintage photos that grace these cards set this website apart from the competition and evoke a gentle time from the not-too-distant past. There are almost too many cute birthday e-cards to choose from at ATM Greetings.com. Fortunately, they are all winners and sure to make someone happy. In additional to romantic and funny themes, ATM Greetings offers cards for belated birthday wishes that come with a hint of humor and sincere (late) wishes. Find the perfect birthday e-card from the collection of disarmingly simple and colorful images at E-Cards.com. Charm your friends on their birthdays with cards that are bound to bring a smile to their faces. Birthdays are all about people as are the beautiful birthday e-cards at CowrieCards. The site's slogan is "Where Colorful People Greet," which is spot-on for one of the few sites that feature people of color in its greeting card lines. Make sure your birthday wishes arrive on time with an e-card from CrossCards. This mix of Christian and traditional cards offers scriptures and inspirational messages to brighten the recipient's day. Don't wait until your friends blow out their candles to send your electronic birthday wishes from Paperless Post. Choose a modern or traditional ecard to brighten your friend's day or personalize a card with photos. The Doozy Cards website will tickle your fancy with its collection of cute and laugh-out-loud funny e-cards. Categories as varied as Musical, Adult, Cat, Celebrity, Christian, and Democratic, among other, make finding the right card a breeze.